Hebrew Language - Shy Publishing Corp.
Our Hebrew language series use systematic methods to teach Hebrew at all levels starting from kindergarten through high school. Browse these categories under "Hebrew Language"
Featured products under "Hebrew Language"
Hebrew reading instruction integrated with language skills acquisition (oral and written skills). 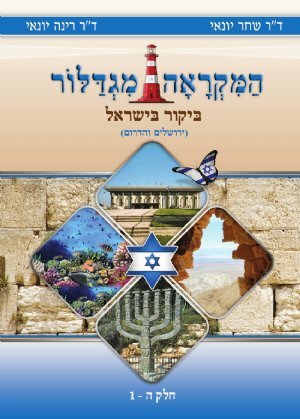 YESODOT HALASHON - REVISED, PART 1 contains all the elements of effective teaching methods of a foreign language found in the original YESODOT HALASHON PART 1. In the REVISED book we rewrote, updated, reorganized the material and printed it using the latest graphic and printing methods. The book contains many lively and colorful pictures. This book emphasizes Oral language skills as the key to make Hebrew learning functional and lively. A Hebrew Readiness program - useful at the pre reading stage of the Hebrew Language acquisition. It prepares the young students to speak the Hebrew language using a basic and frequently used vocabulary simultaneously with teaching the sounds of all the Hebrew Alphabet. MIGDAOR LAGAN - TEACHER'S GUIDE - provides the Kidergarten teacher with clear explanation on how our Kindergarte program works. The booklet is provided free to schools who order the Migdalor Lagan for the entire classe. Set of 8 posters for RM1-RM3, HH and HD. Achievement Test for the book Reading and More, Part 3. Achievement test for the book Migdalor Reader, part 1. Vocabulary flash cards for the Holidays booklet for Kindergarten. Hamikra'a Migdalor 4, parts A and B are a direct continuation of Hamikra'a Migdalor parts 3A and 3B in vocabulary and grammar units and are designed largely for 4th grade students. The Migdalor Reader 4, Part B is a direct continuation of the Migdalor Reader 4, Part A. It contains stories, poems and songs as well as other language-related activities on topics such as Friendship, Children Helping and other Children stories. 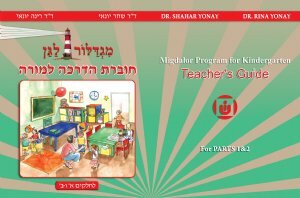 It comes with a variety of photographs, audio CDs, and posters to help achieve the main goals of improving oral and written language skills, as well as improving reading skills in Hebrew (with an emphasis on comprehension). YESODOT HALASHON - REVISED, PART 3 is a direct continuation of part 2. It contains all the elements of effective teaching methods of a foreign language found in the original YESODOT HALASHON PART 3. In the REVISED book we rewrote, updated, reorganized the material and printed it using the latest graphic and printing methods. The book contains many lively and colorful pictures. This book emphasizes Oral language skills as the key to make Hebrew learning functional and lively. The Migdalor Reader Part 5A tells about ten young students visiting various places in Jerusalem and Southern Israel while learning about the geography, history, culture and social life in Israel. This book is accompanied by an audio CD and DVD clips. The CD contains songs and readings from the book and the DVD shows pictures on various topics taught. YESODOT HALASHON - REVISED, PART 2 is a direct continuation of part 1. It contains all the elements of effective teaching methods of a foreign language found in the original YESODOT HALASHON PART 1. In the REVISED book we rewrote, updated, reorganized the material and printed it using the latest graphic and printing methods. The book contains many lively and colorful pictures. 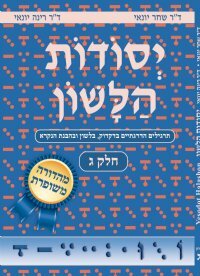 This book emphasizes Oral language skills as the key to make Hebrew learning functional and lively. The Migdalor Reader Part 5B tells about ten young students visiting various places in Southern Israel while learning about the geography, history, culture and social life in Israel. This book is accompanied by an audio CD and DVD clips. The CDs contain songs and readings from the book and the DVD shows pictures on various topics taught. Systematically develop vocabulary, grammar, and oral and written expression.